Saw a Youtube video of a CLS63 with the M156 engine, and the owner claimed the engine speed is limited to ~3500 when it's cold. Is that true? Didn't think so. Nope. I have a dash cam and caught a body shop revving my car when cold. And my C mode revs above 3500 rpm when cold sometimes. Absolutely not true that there's a rev limit when cold. ok thanks... too bad. Am dropping mine off for some work tomorrow and worried about that. Nope- I can confirm there isn't one on my '12 either. I've dropped the hammer before it was fully warm before... Not one of my proudest moments, I know. 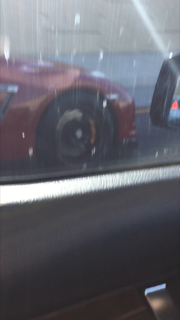 But, its not everyday a GTR pulls alongside of you and wants to run! In the market for one. Been browsing and see BlackVue/FineVu are popular choices. I have the A118. It's like $50 on amazon. The new A119 is supposed to be even better. I have been looking at the BlackVue 650 2 channel so that gps speed is stamped on the video and can be played back via a phone on the spot. That would be better for traffic stops and accidents to play back video. Mine is a cheap camera that requires you to pull the SD card to see the video. It's a great budget cam. If I were doing it now, I would get the A119c (the C is the capacitor version). I am actually thinking about getting the A119c for my girlfriend. It depends what you want the camera for, but youtube has plenty of reviews for cameras. On Friday when I get off this ship I can look up the dash cam channel that I follow on youtube. After doing some research though, I finally upgraded to the BlackVue 1 ch. It has wifi so you can view videos from your phone and a parking mode too which is awesome in case something happens to your car while your gone. Both are great dashcams from my experience, but the blackvue has more options, which is why it cost more too, that I wanted to give me more peace of mind.